With moving the kitties to the binding pile, I decided that it was time to let myself do a new project .. wow my first one this year since ‘The Big Fan’ Mystery that I did (which is up for basting btw). This one’s the Square Deal Mystery from quiltbug.com – Kris has this listed under free stuff / mysteries – she’s also the list owner for QuiltersBee, one of the Yahoo Groups I belong to. This is another New Years Day mystery that I wanted to do, but didn’t get to on the day for various family reasons. (Yes I was planning on doing two mysteries the first few days of the New Year ;)) Glutton aren’t I??? I was planning on doing this with orange as my main colour, and doing it scrappy if I needed to .. now I LOVE scrappy quilts, but there seemed to be a lot of cutting for this mystery, and frankly, the idea of digging thru my scrap bag and getting ‘enough’ colours together in each colour family in each value was just to much for me to even think about .. so I didn’t .. 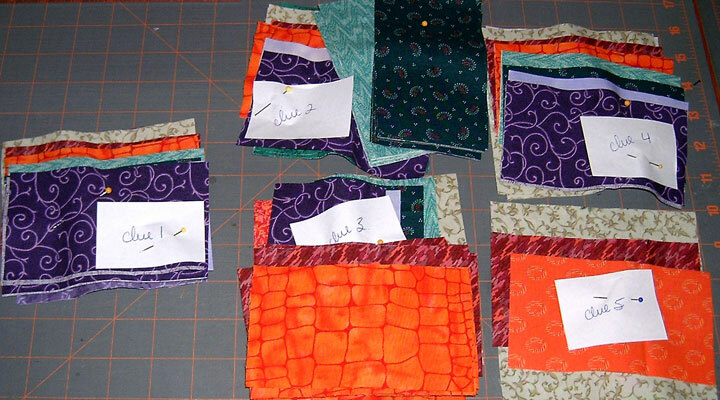 Figured I would would work with FQs if needed (for the orange), and larger scraps .. I won’t bother showing you a pic of my table with with all my fabrics exploded all over it .. it made no sense to me and I was here LOL. I decided on orange, green and purple for my colours for this quilt – and was able to use larger scrap pieces for the purple .. I made a mistake when I started to cut .. I used my dark orange instead of my medium orange for the main colour and since I was using FQs, there just wasn’t any to spare, and it was to narrow for the rectangles .. so I needed to get inventive with another dark colour .. then I remembered the binding that I used for kyle’s quilt .. it was red with orange in it 😀 PERFECT! So that became Colour 1B (dark) for this mystery and while it doesn’t work as well as my original plan did, this works well enough .. I was able to salvage that mistake at least and I needed to cut inventively and creatively for my background material – please don’t ask unless you want to hear my cry! (Note to self – get blender material!!!) So I took last nite and cut out all my pieces for the clues and labelled just so .. All I need to do is put the stickers on for which square is what number and I’m ready to start Clue 1 😉 I’m tickled about this mystery and am VERY excited to do this .. yes I know what it looks like and that’s the HUGE part of it now for me, instead of the mystery of not know .. I’m wishing I had been capable of doing this on New Year’s day .. but I’m going to love this one! yes, you do love them all but how can you not when you look forward to starting and then finishing each one?! 🙂 Can’t wait to see your progress. I bet your square deal is going to look great. I like the fabrics you chose.